With my internet down the whole day, I actually got some work done on my pixel art tutorial! In one segment I talk about common "doesn't look so good"s, and then tried to include some of the more blatant ones in one image. I've made my own "fixed" version of this and written about the process in detailed steps, but before I post that I think it would be interesting to see what other people would do to it (should be a quick edit since it's just a few tiles and a character). I'd like to feature the "guest edits" people do just to give this particular segment of the tutorial a bit more... range. So, if you have the time, I'd like to see your edit and perhaps a few (<5) sentences (nothing too lengthy) about some choice that you made which is of particular interest. The original shows some kind of 16px front+top-down RPG with no particular color or tile count restriction. Do keep the dimensions for comparison's sake. I left the grass field 2x2 to demonstrate simple grass tiling. We have the typical cliffs/mountains and trees/forest and a lake/ocean. The character is a bit taller than a tile, and there's some sort of gem drop/treasure (feel free to nudge). The assumption here is that the author just wants his pixel graphics to look "good" but whatever edit that you make will be fine and probably ponderworthy to the reader. Something from the line art thread. Wasn't quite happy with it so I didn't want to bump. Probably needs minor... enhancing saturation points. I started editing Megaman (girl? ), but felt that it became too noisy. Gradients and unnecessary colors were prevalent in the original, that was the first issue I addressed with each asset. Instead I focused on tightly placed pixels and kept a light source direction in mind to convey form in the small area given. Focus was placed on how different surface materials reflect light to better convey them. Single pixel noise was minimized to allow the eye rest in areas that would have large expanses such as the grass and water. And I'm happy for whatever comes my way actually. If that was for a real comment, I'd start saying that the fixme-picture needs sizes to be sorted out. A house should be large enough so that people can go through the door, and a tree is usually taller than a man. Do you expect things like that to get fixed as well ? Musclebaby all the way. That mockup could have just been replaced with fire emblem gba sprites and tiles, some of the best examples of this scale sort of thing. PypeBros> No, the iconographical liberties sort of belong to the suggested format (e.g. early Dragon Quest, SaGa, Final Fantasy). This exercise is more about the... pixling of stuff. YellowLime> Good, good, I'll take it! I like its pleasant softer mood. I started on a little game engine. 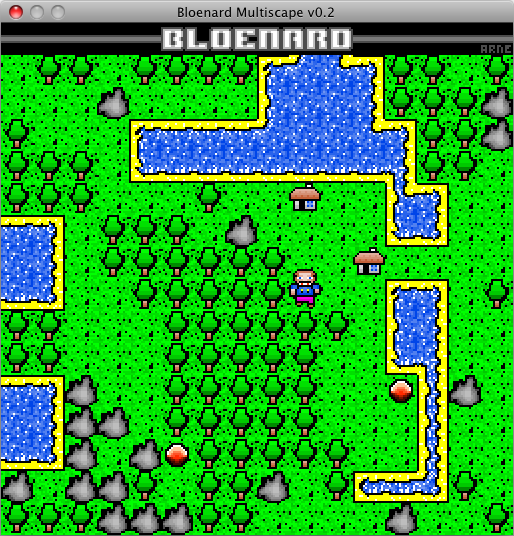 The idea is that Bloenard, our hero, can wander from screen to screen and collect gems (nothing fancy). The game will skin each screen using tile sheets found in the gfx folder, so the game world will be a haphazard melange of styles. Edit: Rewrote the beach tiling so it only uses 4 tiles divided into 4 corners (8*8px). No one likes to pixel tons of beaches and this made it easier to write a safe water generator. Added movable character and gem drops. Sprite sheet. Had to throw some rhomboid pattern compulsion in there. Duplicates of some frames because I support randomization (though this sheet doesn't use it). Unsure if ocean will animate, because the beach won't. I focused on removing unnecessary colors, black lines and single pixel noise (although the water speculars were kinda nice =)). Tile colors were desaturated compared to sprites. Duplicated tiles were used to make double versions to try to break the grid. Will you be posting mockups of these later? I'm unsure how the tiling in mine works out. I don't care about color-count (36 up to 43). Because the tile are so small, clarity is most important. Each tile has its own sub-palette, no reuse of colors. Increases readability through color-coding. For the pixel-clusters: I use mainly flats, tried to avoid gradients and single-pixel noise. No black outlines or lines inside forms to separate different parts. The design of the objects are symbols, abstracted forms which should convey a general idea, not something specific. The perspective changed from side-view to somewhat top-down-front-ish. Light comes from above, object cast shadows underneath them to increase the feel of 3d space. The character is 23px out of 24px high, so it can bob 1px while walking.